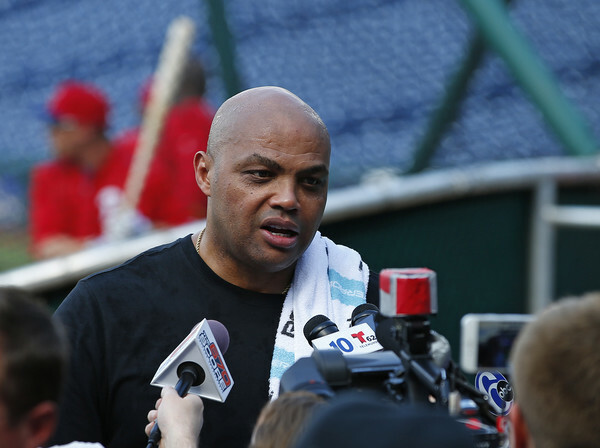 Former NBA player Charles Barkley talks with reporters as of the Philadelphia Phillies take batting practice before a game against the Chicago Cubs at Citizens Bank Park on June 6, 2016 in Philadelphia, Pennsylvania. *TNT analyst Charles Barkley is standing by his criticism of LeBron James one day after being viciously dragged by the Cleveland Cavaliers’ star during an ESPN interview. Last week, Barkley said James was being “whiny” for publicly saying the Cavs need to bring in another playmaker. When asked Tuesday whether he felt James’ clap back crossed the line, Barkley said it was a case of shooting the messenger and that he had no issues with James’ remarks. Despite rankling NBA’s biggest star, Barkley said he doesn’t plan to bite his tongue. James, clearly irked by Barkley’s comments, told ESPN’s Dave McMenamin on Monday night that he won’t let Barkley “disrespect my legacy like that,” and took some personal shots at the Hall of Famer.